MIAMI (22 de marzo del 2019) – El apremiado cantante de la música regional mexicana, Luis Coronel, deleita a todos sus fans una vez más con el lanzamiento de su nuevo sencillo, “¿PA’ QUE NOS HACEMOS?“, junto a la talentosa Banda Los Recoditos. El sencillo ya está disponible en todas las plataformas digitales de música y el video en el canal oficial de YouTube del artista. Después del contundente éxito de su último sencillo, “Mentirosa”, – lanzado a principios del pasado noviembre y con el cual logró más de 3 millones de visitas en YouTube y millones de reproducciones en las plataformas digitales – Luis nos sigue demostrando la constante evolución de sus destrezas musicales con este nuevo proyecto. 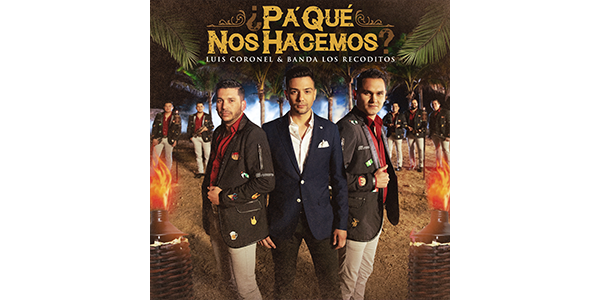 MIAMI (March 22, 2019) – Regional Mexican music heartthrob, Luis Coronel, is ready to charm his fans once again with the release of a new single, “¿PA’ QUE NOS HACEMOS?”, alongside the talented Banda Los Recoditos. The single is now available on all digital music platforms and the video on the artist’s official YouTube channel. After the resounding success of his latest single, “Mentirosa”, – released last November, and with which he achieved more than 3 million visits on YouTube and millions of streams on digital platforms – Luis continues to demonstrate the constant evolution of his musical skills with this new project. In this new musical proposal, the singer-songwriter reveals a more mature attitude with new messages and sounds, bringing his craft to a higher musical level. This collaboration is unique in the genre, since these are not so common in Regional Mexican music. In addition, “¿PA’ QUE NOS HACEMOS?” shows a more playful facet, as opposed to the typical innocence he showed in his earlier works. The music video, filmed during the Carnaval de Mazatlan, in Mazatlan, Sinaloa, shows Luis and Banda Los Recoditos in a colorful beach set on the Malecón, where they are working and dancing while trying to conquer the starring girls. Recently, Luis attended the BMI Latin Music Awards and appeared on the red carpet looking impeccable, as always. During the ceremony, the artist received recognition for his recent success, “Tal Como Eres“.